Give a girl some sparkle polishes and this is what happens. They get layered for maximum sparkleage. Because let's be honest, you really can't ever sparkle too much. This layering came to me when Poppin' Bottles and Purple Haze arrived from Pure Ice. I had already worn Moonlight, but I hadn't swatched it, for whatever reason. 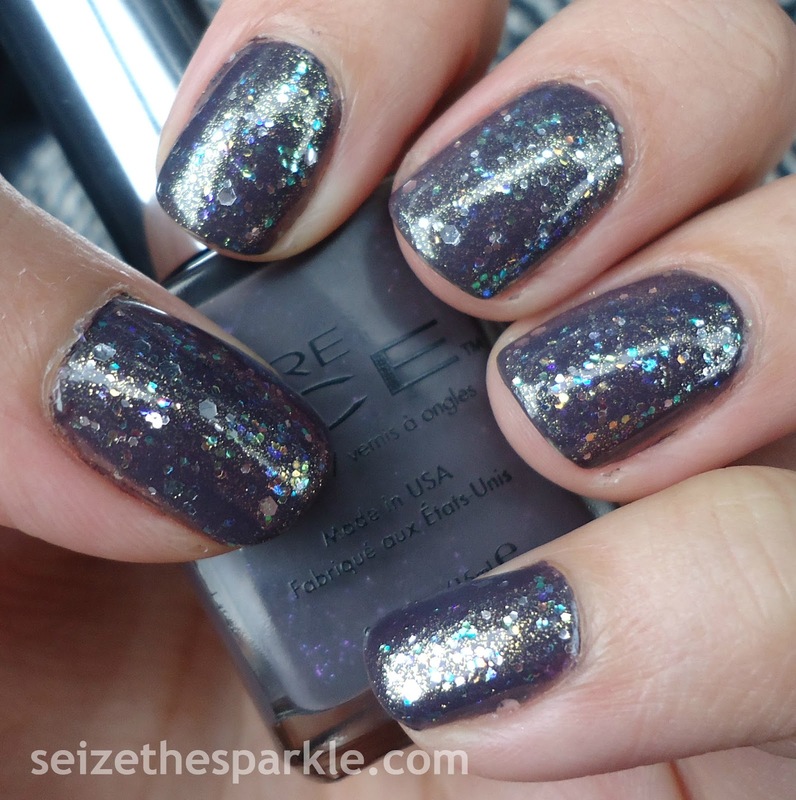 It's a gorgeous purple leaning gray creme polish with superfine blue and purple glitter. Definitely pretty enough on its own, but it needed more. I wasn't really sure which glitter I wanted to layer on first, so I dove right in with a coat of Purple Haze. It's got opalescent glitter that flashes orange, green, blue, teal, and purple in a sheer purple base. It's just the right glitter to polish ratio, too! Poppin' Bottles was layered on next, and added a coat of super-fine gold shimmer, with silver hexagonal glitter. I'm so beyond thankful that I picked up a bottle of this in addition to the one PR sent. If you're into layering, you've gotta have it, and we all know how I looooove to layer! I'm really loving how this layering turned out, so much so that I just couldn't take it off last night! 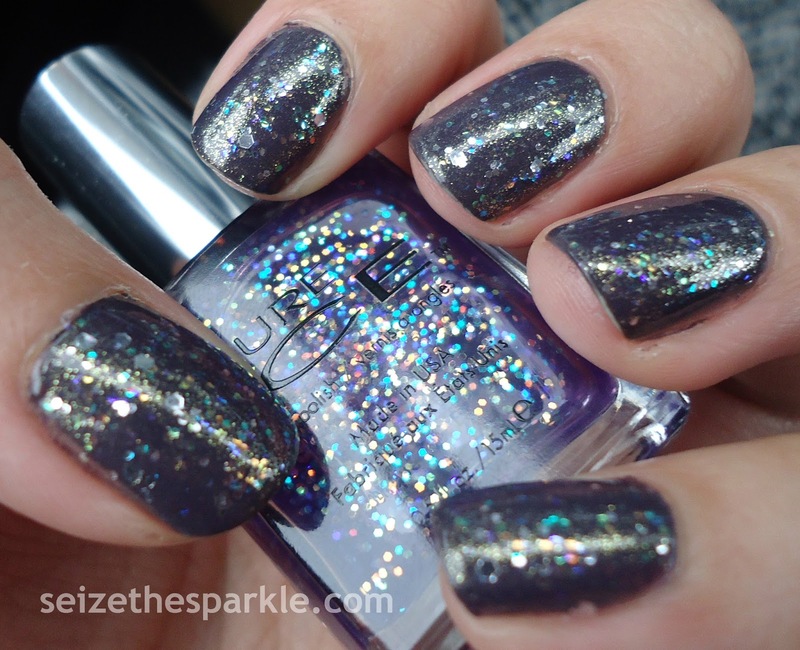 Purple Haze and Poppin' Bottles are actually part of Pure Ice's New Year New Hue collection sent to me for review. I plan on swatching all 8 polishes on wheels, plus showing you some fun looks you can create with them! So stay tuned for that, this week and next week... lots of fun sparkles and layerings to come, I promise!